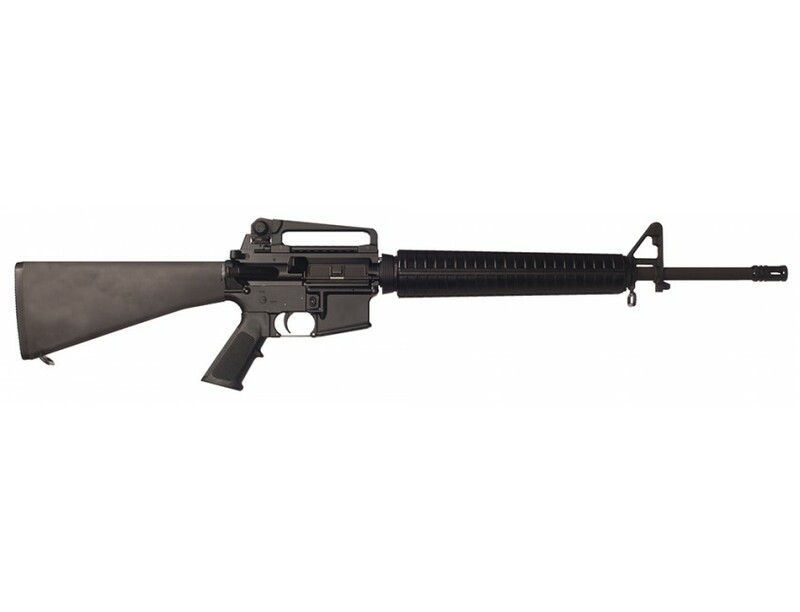 Bushmaster's Target model qualifies as the standard of the line, available with heavy profile match grade barrels of either chrome lined, chrome moly steel, or polished 416 stainless steel. The A3 type uses a flat top upper receiver incorporating a picatinny rail which allows easy attachment of accessory scopes, sights and optic devices. The upper and lower receivers are precision machined from forgings for maximum strength. The upper receiver includes a forward assist device and an integral cartridge case deflector. The lower receiver controls include a bolt catch assembly, magazine release button, and safety selector with indicator markings on both left and right sides. The ribbed front hand guards, molded of polymer thermo set composite, offer increased control and heat dissipation. The pistol grip and buttstock are also molded of thermo set composite, and the buttstock features a storage compartment for small parts or cleaning gear. The Bushmaster target rifle is shipped complete with 30-round magazine, safety and operational manual, and carrying sling.